The DJL lamp is one of the most widely used lamps found in vintage movie film projectors. Some of the best quality 8mm and Super8 projectors ever made, especially those by Bell & Howell used DJL lamps. The last few years the DJL lamp has become increasingly hard to get, and the prices have skyrocketed. We have come up with a more reliable, much lower cost solution. With just a few tools, you can replace that expensive DJL lamp with our easy to install DJL replacement lamp module!!! This module will fit on all DJL projectors we know of, including all vintage Bell & Howell models. (applications listed below) But if you're not sure just email us. The module comes with a simple set of instructions and 3 minute DVD to guide you through. It can be done in 15-20 minutes. The tools required are hammer, punch, drill and 3/16"& 3/8" bits, wire strippers, screw / nut drivers. The kit comes with housing, lamp, screws, wire nuts, grommet, hole drilling template, instruction sheet, and DVD. Should the lamp ever need to be replaced, it simply pops out with a gentle pull on the lamp housing lever. 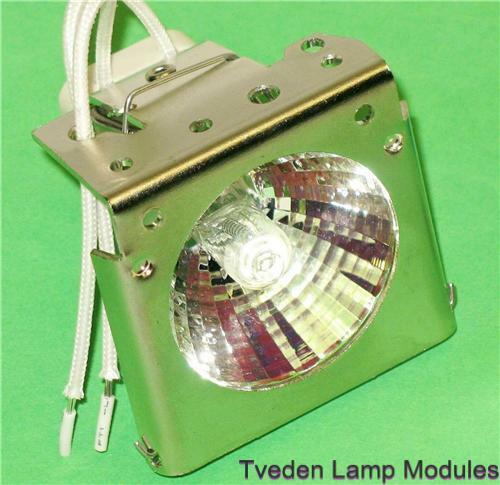 Replacement lamps can be purchased in our store. The cost is just $25.00 - $38.00 with free shipping! Compare with DJL lamp prices and you can see the savings are significant! This way too, you can keep using the old family projector!